FORMER British Lions forward Scott Quinnell has thrown his support behind this year’s Paul Lethbridge Memorial Day. The event will take place on Sunday at Weston Mill. Activities will start at 12.30pm, with a rugby match between an Old Techs XV and a Tamar Saracens XV kicking off at 2pm. The day is now in its sixth year and is held in memory of former Tamar Saracens, Old Techs and DHSOB player and youth coach Paul Lethbridge, who sadly died in 2013. This year the Plymouth rugby community will be helping to raise money for St Luke’s Hospice. 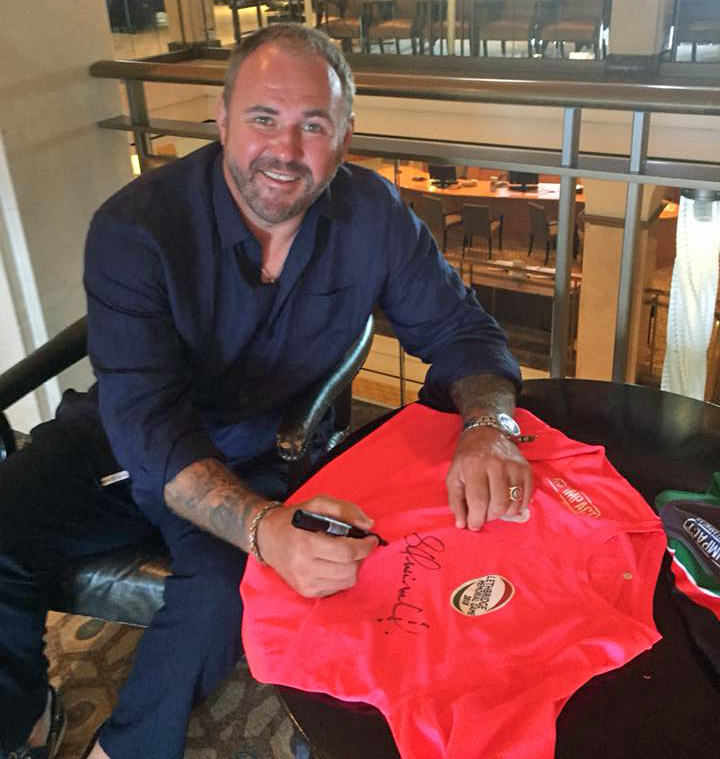 Wales international Quinnell has signed a couple of shirts to be raffled off and also did a video good luck message (VIEW HERE) for the day after meeting Old Techs and Plymouth Combination committee member Mike Oxland on a recent cruise. As well as the rugby match there will be a hog roast, beer tent, bouncy castle, facing painting, a sweet stall, a tug-of-war competition and a crossbar challenge. There will also be an evening function starting at 6pm, which will be when the raffle is drawn. Special event shirts are available from Fitness for Sport for £10 and there has been a competition running to get pictures of the shirts in the most random of places. So far shirts have found their way to Mount Etna, James Bond Mountain in Switzerland, the Rocky Mountains, the Alps and Mexico. Players who want to play in the game must have bought a memorial shirt. Organisers are still looking for further raffle prizes. If any companies or individuals have anything they want to donate they should get in touch with Tamar Saracens, the Parkway Social Club or visit the Paul Lethbridge Memorial Day Facebook page HERE.